Another account of St. Barbara. The holy virgin and martyr, St. Barbara, who, from the most ancient times, has been celebrated in the whole Christian world, was born of heathen parents in Nicomedia, of Bithynia. She was much beloved by her father, Dioscorus, on account of her unusual intelligence. He appointed a tower as a special place, well fitted up, for her dwelling, and chose the best masters to instruct her in art and science, but especially in paganism, as he feared she might be induced to unite herself to one not agreeable to him, or be seduced by the Christians, of whom he was a great enemy. But just this solicitude of her father gave her cause to think, and thus to arrive at the knowledge of the true God. She contemplated the heavens, the sun, moon and stars, in their regular course; she meditated on the changing of the seasons; looked on the wonderful creation of the world and its inhabitants, and justly concluded from it that there must be a Creator—that He alone must be the true God, and that the gods she worshipped had no power. To these contemplations she united prayers, and also led a most blameless life. The Almighty, who forsakes not one who aids himself, gave her opportunity to become instructed in the Christian religion, and to receive holy baptism, without the knowledge of her father. Meanwhile, a suitor for her hand came to her father and asked his consent. Dioscorus was not unwilling to grant the wish, as the young man was his equal in rank and wealth; but he would make his daughter acquainted with the offer he had received for her before he gave his word. Barbara had a great many objections; and her father, who did not desire that she should hastily give her consent, and would not coerce her, urged her no further; and as he was about to set out on a long journey, he thought it but right to give her some time for consideration. Barbara requested to have, for her greater comfort, a bathing-room added to her dwelling, which Dioscorus gladly granted her. The object of the holy virgin was, to have a special apartment where, with those who, like herself, were secretly Christians, she could pray to the true God. The father ordered two windows for the new room; Barbara, however, had a third added, in honor of the three Divine Persons in the mystery of the Holy Trinity. The room was, by the pagan's order, adorned with idolatrous statues, with which the holy virgin would gladly have dispensed. Looking at them, she wept over the blindness of her father, who desired that she should worship them as gods. Going from one to another, she spat upon them, saying: “Those who honor you as gods are worthy to be turned into what you are made of—wood and stone.” After this, she went to a column of marble, and with her fingers pressed the sign of the cross upon it, as if it had been wax. After her death, the health of many infirm, who devoutly kissed this miraculous cross, was restored. Martian at first showed compassion for the Saint, in consideration for her youth, and endeavored to win her by flattery and kind words. Not succeeding in this, he had recourse to severity, and had her whipped with scourges, until her whole body seemed to be but one great wound. After this, she was dragged to a dungeon, where she was left to die. The Almighty, however, who had destined her to still more glorious combats, sent an Angel during the night, who healed all her wounds, and encouraged her to perseverance, with the promise that she would overcome all tortures by Divine assistance. The following day she was again brought before Martian, who, not comprehending how Barbara had been healed, ascribed it to his gods. The virgin, however, said: “No, no, Martian! Wood and stone, of which your idols are made, have not this power. It is the work of the God of heaven and earth, whom I worship as the only true God, and for whose honor I am willing to die.” Martian, full of anger at these words, ordered her to be tormented more cruelly than on the previous day. After her body was all bruised and wounded, she was barbarously burned with torches, and at last both her breasts were cut off. The torture was very great, but the eagerness of Barbara to suffer for Christ's sake was still greater. She gave no sign of pain, but turning her eyes to heaven, said: “Let not thy hand, O Lord, forsake me! In Thee I am full of strength; without Thee, I am powerless!” A new martyrdom followed after this. The tyrant commanded her to be scourged in public through all the streets of the city. This was more terrible to her than all her previous tortures; hence she turned to the Almighty, praying humbly that she might not be exposed to the eyes of the heathen. She was immediately surrounded by a bright lustre, that veiled her form from all eyes. The barbarous Dioscorus was present at the martyrdom of his holy daughter, from beginning to end, and not only looked with satisfaction at the whipping, burning, and cutting, but animated the executioners in their cruelties; and when Martian, at last, sentenced Barbara to be beheaded, he asked, as a favor, to be allowed to take the place of the executioner, and behead his daughter. Having obtained his request, Dioscorus took her to a neighboring mountain, followed by a great crowd of people. Barbara rejoiced to be thought worthy to die for Christ's sake; and no sooner had she reached the mountain, than she again thanked God for all the graces that He had bestowed upon her, and begged Him to assist her to the end. A voice was heard from on high, which invited the undaunted martyr to come and receive the crown that awaited her. Kneeling down, she bared her neck, and received from her father the fatal stroke. She was hardly twenty years of age. Juliana, a pious woman, who had been present at the martyrdom, burned with the holy desire to give her life, also, for Christ, and was beheaded on the same day, after she had suffered great torments. Her body was laid beside the body of St. Barbara; but her soul followed the soul of the fearless virgin into heaven. Quite different was the end of the inhuman father. Whilst he was descending from the mountain, with the blood of his innocent child still on his hands, a terrible thunder-storm arose, during which he was struck by lightning, and sank dead upon the ground. Thus the father went to hell on the same day on which his daughter ascended triumphantly to heaven. 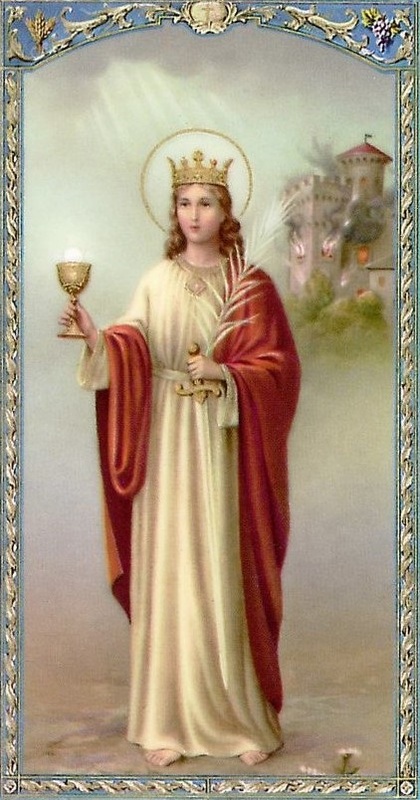 We must not omit to remark that St. Barbara is especially invoked in the whole Christian world for the grace of receiving the last sacrament before death; and many facts have shown that this invocation has the desired effect. Also read – December 4, 2018: St. Peter Chrysologus Bishop, Confessor, and Doctor of the Church.